In Part 1 on Healthin30, “Guy Kawasaki Jumps the Curve with Enchanting Insights to Empower,” Kawasaki offers insightful tips to help companies succeed. Whether the company is a start-up, health care technology company, pharma company, medical practice, major health care organization, or a leading company listed on Forbes, “enchanting” insights can help different types of businesses (and people) thrive. If I waited a week, I’d still make the same decision. A year from now, this decision will still be a good one. I’ve done my homework by reading independent reports and reviews of the product/service/organization/idea. I am fully aware of the total cost of this decision, including installation, support, maintenance, subscriptions, and upgrades. This decision will not harm people. This decision will not unduly harm the environment. This decision isn’t unethical, immoral or illegal. This decision will not set a bad example for my children. If no one could see that I was doing this, I would still do it. If everyone could see that I was doing this, I would still do it. What tips do you have to “enchant” people? What insightful tips do you have for companies to succeed? 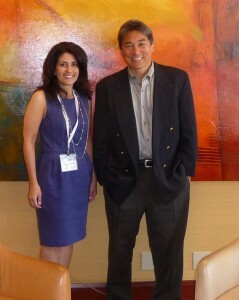 Guy Kawasaki is the co-founder of Alltop.com, an “online magazine rack” of popular topics on the web, and a founding partner at Garage Technology Ventures. Previously, he was the chief evangelist of Apple. Kawasaki is the author of ten books including Enchantment, Reality Check, The Art of the Start, Rules for Revolutionaries, How to Drive Your Competition Crazy, Selling the Dream, and The Macintosh Way. Kawasaki has a BA from Stanford University and an MBA from UCLA as well as an honorary doctorate from Babson College.